Johnny and Wilfred were posted up by the side of the house chopping it up about their commonalities both being first-generation Filipino-Americans (naturalized in the 1970s and 1980s). 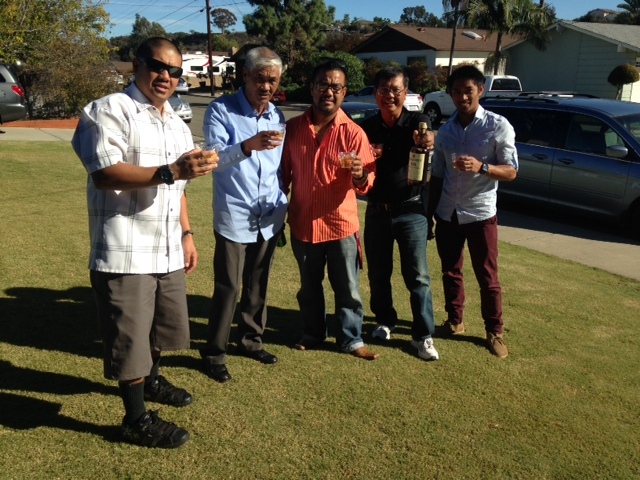 Both lolos (“grandfathers” in Tagalog) were in high spirits as they watched their kids and grandkids prepare Thanksgiving dinner in Clairemont. Pulutan is the Filipino word for an appetizer or side-dish devoured with liquor, but not to complement one another’s flavors, as cheese does to wine, but rather to give the drinker more stamina by adding a buffer between the stomach lining and the bloodstream. At this party, lumpias, turkey skin, nachos, Porto’s Rolls, and chicharon bulaklak were the foods chosen to help tame the buzz that was about ready to ensue. Although this particular bottle of whiskey was aged six years in Canada prior to its bottling in 1973, it neither deteriorates nor ages (better) in taste, according to whiskey websites. Some of the active members on Whisky Magazine and Club Whisky, which have a internet forums on the subject of older whiskey, mentioned that as more oxygen enters the bottle as the whiskey is consumed or oxidized, the likelihood of it not tasting the same increases. They also mention that the bottles have to be stored in upright positions, at approximately 65 degrees, and away from sunlight for the liquor to taste like it did the day it was bottled. 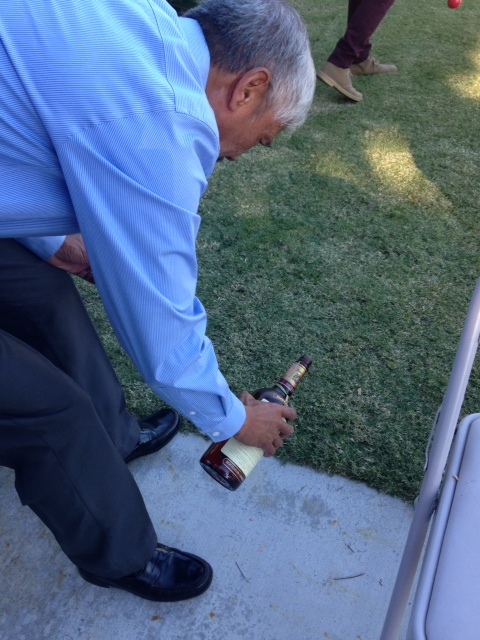 The cases of old liquor were unveiled at the party by Michael, the brother of the hosts of the party. Michael purchased multiple sealed whiskey and vodka cases from a San Carlos estate sale that also included hundreds of articles of women’s clothing. At the time (in 2009), Michael purchased the items for resale via his Etsy and eBay businesses. The clothing sold briskly because of collectible Hawaiian muumuus and hundreds of 1960s mod to 1970s disco stilettos. The sealed whiskey and vodka bottles weren’t sellable because of rules and regulations. 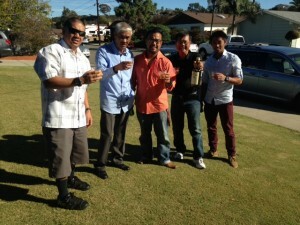 This whiskey may be common to the aficionados, but certainly not to this group of guys performing the tagay ritual of the Filipinos, where they sit or squat in a circle and take turns drinking from a single glass until the bottled is consumed. 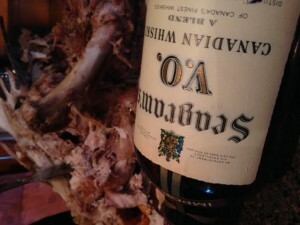 “Okay, guys, we finished off the 1973, it’s time for the 1974,” said Johnny, who broke the crumbling seal. 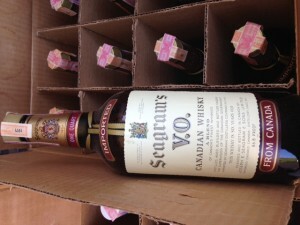 The consensus was unanimous — whether on the rocks, with 7 Up , straight up, or chased, the Seagram’s VO’s appearance, smell, and taste, surpassed the 2014 vintage. The vodka, on the other hand, was stale, but mixed with lemonade, it was drinkable. Published in the San Diego Reader on Dec. 9, 2014.